What is Michelle Obama’s Hugging Style? What do Michelle Obama’s Hugs Mean? Here are my rough notes describing the meaning and style of Michele Obama’s Hugs followed by a piece I did for Daily Beast about Michele's hugging body language. Michele Obama is a hug initiator she goes into the hugs first and she likes to be "on top" when she hugs. Michele's preferred way of hugging is to have her arms up and around and have the other person, (if they choose to hug back), arms below hers. Going first and hugging on top are power moves and a maternal/matriarchs style of hugging. Amazingly, she even does this with some political figures! Presidential wives have always been "bottom huggers" But, there are many photos of her hugging dominant world leaders with her arms on top. You rarely, if ever, see women as "on top" huggers except for big stars females of Hollywood. Michele also likes to bring her arms up and over and wrap them fully around to fully encompass the person she is hugging. This shows affection and power. One of the most interesting and what I find is the sweetest aspect of her hugging style is that she likes to place her head right next of the head of her huggee. Sometimes, even brushing her cheek against theirs as she goes in. That is a very giving and intimate way to hug. Many huggers are only halfway huggers and don't give their full upper torso. You see them actually have conflict about being too close. You can see them hold their head slightly back and I can see tension in their necks as they make a real effort to not be too close or too intimate. Mrs. Obama wants to have that head connection. I would call Mrs. Obama a Big Bear hugger which is defined by the arms being wrapped fully around the person and being pulled in tight with a quick but tight secure squeeze. This shows enthusiasm for seeing someone and can also show someone’s need to show power over or protection of the huggee. At the White House Correspondents’ Dinner, forget the jokes and schmoozing. The real power lay in FLOTUS’s embrace. 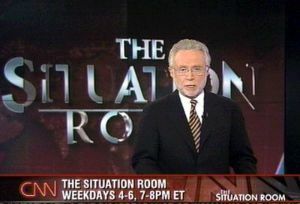 Even though Ezra Kaplan was awarded $5,000 towards his journalism studies before a room full of the nation’s most acclaimed reporters and glittering celebrities, the true highlight of the White House Correspondents’ Dinner was the hug he received from Michelle Obama. But more intriguing to analyze was the onward hugging march of Michelle Obama, who embraced nearly 20 journalism scholarship recipients, a gesture of physical intimacy that is now a trademark for the current FLOTUS. After speaking to multiple body language experts, the consensus is clear: Michelle Obama is an exceptionally pro-hug first lady, and what she communicates via her willingness to embrace others says much about her personally. “I do think she hugs more. 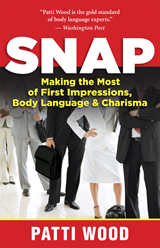 She stands out,” says Patti Woods, the author of Snap—Making the Most of First Impressions, Body Language, and Charisma and a teacher on body language for over 30 years. It’s not just the frequency of Obama’s hugs, but the types of hugs she gives, which is unique for first ladies, says Woods. “Typically, it’s been fairly formal. There’s more restraint, holding the pelvis back and the head back. You see a lot more body tension around former first ladies, a lot more upper body going forward but the rest of the body going straight down. It’s less giving. There’s less intimacy,” she says. That stiff, restrained embrace—the kind that have all the artificial, unfulfilling sweetness of a pack of Sweet’N Low—is not Obama’s style. Noor Wazwaz, another scholarship recipient who received a coveted FLOTUS hug on Saturday night, can certainly attest to that. 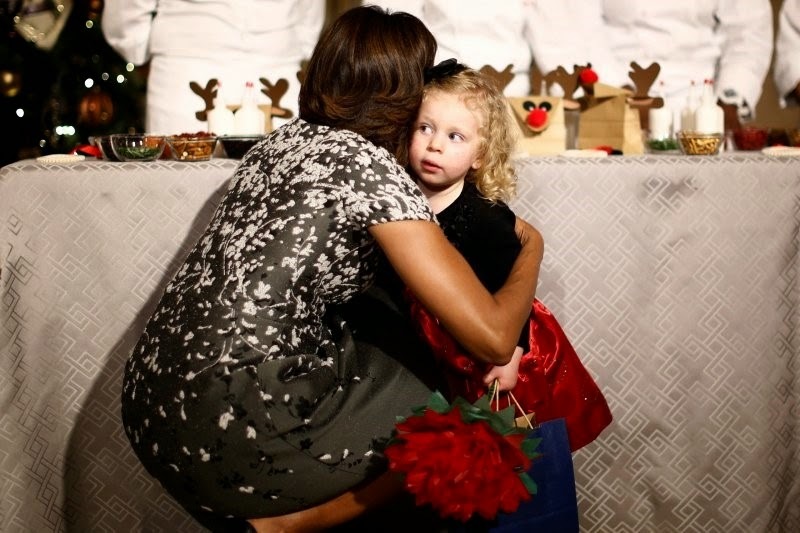 However, it’s not as if Obama exactly had stiff competition to become the most huggable first lady. Historically, the White House spouses are not known as the most physically affectionate creatures. There’s Barbara Bush, who, according to a Vanity Fair profile in 1992, terrified the White House staff—“when she frowned it had the capacity to send shudders through a lot of people,” one Bush associate told the magazine. No first lady was more regal than Nancy Reagan. Her Dynasty-era glamour was strictly look-don’t-touch. She was more famous for lecturing the youth of America on the perils of drugs, not holding them close. Any physical intimacy was strictly for her husband. Even Jackie Kennedy, one of the most adored first ladies in U.S. history, was not a woman to be hugged—publically at least. The young and stunning Mrs. Kennedy was an alluring asset to JFK’s 1960 presidential campaign. However, her hair was so perfectly coiffed, her Oleg Cassini ensembles so pristine, her accent so utterly patrician, one could not imagine embracing her, lest we blemish her with our plebeian impurities. Obama’s move to be less formal and more intimate is not without precedent among iconic women on the world stage. Princess Diana was one of the first female heads of states to relinquish the stately distance for a physical closeness. For Princess Diana to hug a 7-year-old AIDS patient in 1989 was actually a landmark physical gesture, a hug that had social and cultural significance. “She would lean down and look at children at eye level. She was always warm,” recalls Constantine. Far from exhibiting the usual royal parental reserve—Prince Charles famously said he could not remember being hugged by his mother, the Queen—Diana relished hugging her own boys. Indeed, both Diana and Michelle Obama have shown personas crafted around warmth and accessibility. As such, their hugs may be the ultimate power move, a subversive way of showing strength and authority. Most surprising of Michelle Obama’s hugs was her infamous embrace of Queen Elizabeth in 2009. British pearl-clutchers recoiled with surprise when FLOTUS put her arm around Her Majesty, even though it was the famously formal Queen who initiated the move. Compared to the first lady’s usual style, this was barely a hug, but a warm, firm hand on the back to match the Queen’s own move. Yet even that level of physical intimacy was unprecedented for official White House interactions with royalty. Many would disagree with that: The Queen looks very comfortable, and it more seems a wonderful, impromptu, expressive moment for both women to have shared. Of course, there are those who doubt how genuine the hugs are in the first place. “Are the hugs truly because she wants to connect on an emotional level, or are they robotic? That’s still a question to be answered,” says Constantine. She sees Obama’s hugging as a way to combat the more negative press she received when her husband was first campaigning for president in 2008. That summer, a Pew Research Center poll noted that Michelle Obama was in the press more often than her Republican counterpart, Cindy McCain. But, a higher percentage reported hearing negative stories about Mrs. Obama than Mrs. McCain. “The way she [Obama] wants to be portrayed is countering the bad publicity of seeming mean, angry, bitchy that was out there.” Her excellent, personable hugging has been good PR for her. “The pendulum is swinging the other way over to being sociable, arms around the waist, the girlfriend thing,” says Constantine. 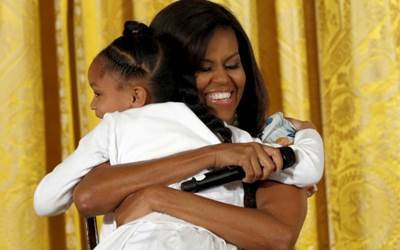 Her hugging has also distinguished the image the Obamas want to portray of a more accessible, “normal” White House. “I think with their whole strategy was about connecting with people. The president and FLOTUS [traditionally] stay in the White House, they don’t intermingle too much. I think they [Michelle and Barack Obama] have broken the rules,” says Constantine. “I think they’re setting trends with a new connectivity with the American people. I think people want to feel like they can talk to people in leadership. I tend to like it, and I’m not even a Democrat,” she adds with a laugh.